At the North Sydney event, 110 people attended and were humbled by the stories of two people who came to Australia seeking asylum, Sameh, an electrical engineer from Syria, and Hava, a lawyer from Afghanistan. 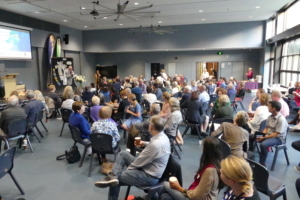 In early November the newly formed Nangami Peace and Justice parish group, in conjunction with Jesuit Refugee Service and Sydney Alliance, hosted a Table Talk. The group chose the Gadigal word nangami, as it means dream, and all members dream of a just world. Fr Daven Day SJ addresses attendees. Since 2015 the Sydney Alliance, a non-party political organisation, has been running an effective campaign to address the polarisation around the issue of people seeking asylum. A Table Talk gives civil society members an opportunity to hear a story of a person seeking asylum and to build a relationship with them in a safe space. The goal is to find common ground in shared values and to build the capacity of the hosting organisation to stand with people seeking asylum. At the North Sydney Table Talk, 110 people attended and were humbled by the stories told by Sameh, an electrical engineer from Syria, and Hava, a lawyer from Afghanistan. As their qualifications are not recognised here in Australia, Sameh is now working as a case manager for Settlement Services International and Hava has just completed the HSC and hopes to study Australian law at university. After Sameh and Hava spoke, the parishioners discussed the impact of their stories on them personally, and several parishioners commented that they felt naively ignorant, angry about the speakers’ situation, and amazed that Sameh and Hava could still feel gratitude for Australia and share their story in such a dignified way. Questions raised about current immigration policy were addressed by human rights lawyer, Carolina Gottardo, Director of JRS. Parishioners then discussed in small groups some actions that the parish community could take. Numerous actions were suggested, centred around six different themes: advocacy, employment, awareness raising, parish sponsorship, outreach/volunteering/fundraising, and youth involvement. Twenty-five parishioners came to the follow-up meeting to begin developing a plan for the suggested actions. Parishioners expressed an overwhelming interest in continuing the Table Talk format and acknowledged that they need and want more information about current policy on refugees and people seeking asylum. Since the Table Talk, sub-groups have continued to meet to discuss actions with the support of JRS. Going forward, Nangami plans to hold monthly meetings as part of the Bookends Project as a way of building support and capacity to effect change.